BOSTON — When she’s not driving her kids around from practice to practice or preparing activities for her pre-K classroom at Central Heights Elementary School, Amy Ashley, 41, of Nacogdoches, Texas, can be found training for the country’s oldest marathon. Despite being active, Ashley did not incorporate long-distance running into her lifestyle until 2011, completing her first marathon with a friend one year later in San Antonio, Texas. The experience, she said, wasn’t her favorite. After two years, Ashley decided to train again and signed up for the Houston Marathon, which led to her qualification for the Boston Marathon. She’s been a regular competitor in both ever since, and the Monday race will be Ashley’s fourth Boston Marathon. Ashley achieved one of her top two times — three hours, 26 minutes and 19 seconds — in her second Boston Marathon in 2017. The Boston Marathon is her most challenging course due to its strategically placed hills designed to “cause runners’ legs to give out,” Ashley said. According to Ashley, the downhill parts of the course seems “easier to run,” but miles 13 and 14 are when the hills “start going.” Many runners can’t get past mile 20, where the “Heartbreak Hill,” a steep, half-mile incline is located, said Ashley. “It’s crazy that Boston is one of my fastest marathons,” said Ashley. 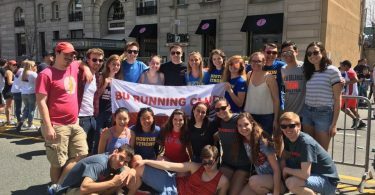 Ashley started training for the Boston Marathon from the beginning of the year. She said she uses the Houston Marathon in January as a practice run — one that doesn’t go in “full force.” Then, after a two week vacation, she began her intense training for Boston. Ashley trained with a combination of running, spinning and muscle workouts six days a week. 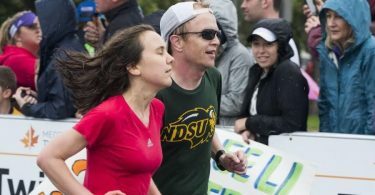 She and her running group would run a rotation of 14, 16, 18 and 21 miles across four Saturdays in a month, Ashley said. But with three kids and a classroom to tend to, finding the time to fit her training in hasn’t always been easy. “But I have to do what I have to do,” she added. While Ashley uses her running time as a personal “therapy session,” she gets through the running course by thinking of solutions for the dilemmas of everyday life involving her family or herself. After running so many marathons, preparation becomes more mental than anything else, Ashley said. Despite of having to take four weeks off of her usual training regiment due to a hip injury she suffered during the Houston Marathon, Ashley said she remains confident about this year’s Boston Marathon. Ashley has family members who live in the Boston area, as well as a group of friends from home who travel to Boston to support her. Every year, the group splits and stations themselves on miles 13 and 16 to cheer Ashley on as she runs the course. But apart from adequate preparation, Ashley said runners should make the most out of their experience.